Delayed presentation of an open Tendo Achilles injury with segmental loss of tendon and soft tissue is a challenging problem for the Orthopaedic surgeon. We present a patient who presented with a 4 x 5 cm open wound and a 4cm segmental loss of the tendon 6 months after the injury. To bridge the defect in the tendon, lengthening of the proximal tendon was done using a tongue in groove sliding technique, and a reverse sural artery flap was used to cover the soft tissue defect. At 9 months follow up, the patient was able to perform a single limb toe stance. The technique and the relative merits of this simple procedure are discussed. Key words: Achilles tendon, Sural artery flap, Bakers slide, Tendo Achilles, tendon rupture. Open Tendo Achilles injuries commonly occur following cycle spoke injuries or after a fall into ‘Indian style’ closets. If patients present within 6 to 12 hours of the injury a thorough wash followed by primary or delayed repair of the tendon can be done. Management of delayed presentation of open Tendo Achilles injuries is more complex, as there is a loss of soft tissue cover in addition to the tendon defect. An effective surgical procedure is required to bridge the defect in the Tendo Achilles, as well as to achieve adequate soft tissue cover. 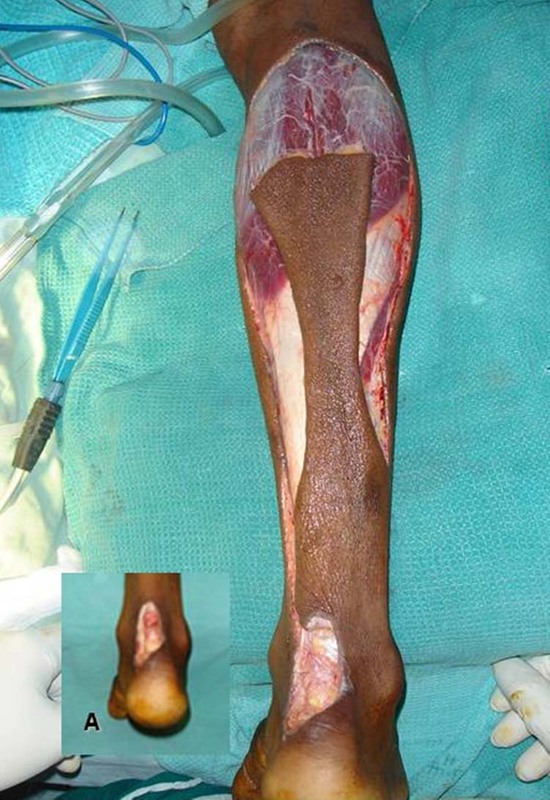 [1,2] A number of procedures have been described for reconstruction of the Tendo Achilles. These include lengthening the aponeurotic tendon either in a ‘tongue in groove’ fashion as described by Baker, or the V-Y technique popularized by Abraham and Pankovich. [1,2] The other methods described for repair of neglected rupture include augmentation with the peronei (Teuffer’s modification of White and Kraynick technique), or with a strip from the median raphe of the proximal tendon (Bosworth’s technique). Management of the defect in an open injury is more complex because of the associated loss of soft tissue cover. The use of vascularised extensor digitorum brevis and various composite free flaps have been described for such defects. These require the expertise of a micro vascular surgeon. We present the case of a patient who presented with a 4 x 5 cm open wound and a 4 cm segmental loss of the tendon six months following a fall. Following a thorough debridement, we opted to bridge the defect by lengthening the tendon with a Baker’s procedure, and cover the skin defect with a reverse sural artery flap. The technique and relative merits of this simple procedure are discussed. With the patient in prone position, the wound was debrided and the residual skin defect measured. Swabs taken from the wound confirmed the absence of active infection. The reverse sural artery flap was elevated before the tendon was lengthened. (Fig 1) The flap was marked proximally on the calf, with the edges 0.5 cm more than the measured recipient area. Figure 1 Presentation of injury. Elevation of the reverse sural artery flap, with insert (A) showing the skin defect over the ruptured Tendo Achilles. The flap has been cut back to a bleeding edge. The small saphenous vein, sural artery and nerve were cut at the proximal edge of the flap and raised along with the fascio-cutaneous flap. The deep fascia was anchored to the epidermis prior to elevating the flap, in order to prevent shearing between the deep fascia and the skin. Distally, the incision was extended up to the medial border of the wound. Laterally, the flap was raised to 7.5 cm short of the lateral malleolus, in order to preserve the perforators from the peroneal artery that supply the elevated flap. At this stage, the tourniquet was released, and bleeding from the flap edge was noted. As the bleeding from the leading edge of the flap was inadequate, the flap had to be cut back until a bleeding edge was obtained. (Fig. 1) The flap was then turned over its pedicle, and laid over the defect. Figure 2 Repair of the tendon using a ‘tongue in grove lengthening’ of the aponeurosis. There was no distal remnant of the Tendo Achilles, and hence the tendon was anchored on to the calcaneum directly. The insertion site on the calcaneum was freshened, and the ethibond suture was threaded through the calcaneum using a Beath pin, and anchored tightly onto the sole of the foot over a button. (Fig. 2) Additional bony sutures were placed between the tendon and the calcaneum. Figure 3 Nine months following surgery, the patient was able to stand on one leg without support. Delayed presentation of open Tendo Achilles injuries require careful repair of the tendon defect, and adequate soft tissue cover. [1,2] Reconstruction of the defect can be challenging, as the blood supply of the Tendo Achilles at its insertion is extremely poor. The reconstruction of Tendo Achilles injuries require meticulous handling of the remnant segments. The mesotenon of the tendon segment near the defect should be preserved in order to maintain vascularity and achieve healing at the site of reconstruction. Bosworth advocated elevation of a full thickness central strip of the proximal tendon, which is turned over and sutured to the distal end of the defect. The ‘turned over’ section of the graft has poor vascularity, and the healing at the repair site could potentially be compromised. If the defect is bridged by lengthening the tendon proximally, the dissection of the mesotenon near the defect is less extensive, and hence the vascularity at the repair site is relatively well preserved. The repair is more biological and is more appropriate for reconstruction of the Tendo Achilles. The repair is also less bulky near the insertion site. For protection of the reconstructed tendon, a full thickness soft tissue cover is necessary, as split thickness skin graft is unlikely to heal over the repair site. The options for soft tissue cover include free vascularised composite tensor fascia lata flap, medial plantar flap with plantar aponeurosis or a free flap. [1,4] These free flaps often require micro vascular expertise. The sliding technique for bridging defects in the Tendo Achilles followed by a reverse sural artery flap is an excellent option for management of delayed presentation of open Tendo Achilles injuries. No benefits in any form have been received or will be received from any commercial party related directly or indirectly to the subject of this article. 1. Mohanty A, Jain P: Reconstructing and resurfacing open neglected Achilles tendon injury by distal posterior tibial artery based adipofascial flap. Eur J Plastic Surgery 27: 196 – 199, 2004. 2. Bullocks JM, Hickey RM, Basu CB, Hollier LH, Kim JY: Single-stage reconstruction of Achilles tendon injuries and distal lower extremity soft tissue defects with the reverse sural fasciocutaneous flap. J Plast Reconstr Aesthet Surg 61(5): 566 – 572 , 2008. 3. Carr AJ, Norris SH: The blood supply of the calcaneal tendon. J Bone Joint Surg 71B (1):100 – 101, 1989. 4. Jeng SF, Wei, FC: Distally based sural island flap for foot and ankle reconstruction. Plastic and Reconstructive Surgery 99 (3): 744 – 750,1997. 1 Assistant Professor,Unit 2, Department Of Orthopaedics, Christian Medical College and Hospital, Vellore 632004, India +914162282172. 2 Associate Professor, Unit 2, Department Of Orthopaedics, Christian Medical College and Hospital, Vellore 632004, India +914162282173. 3 Assistant Professor,Unit 2, Department Of Orthopaedics, Christian Medical College and Hospital, Vellore 632004, India +914162282081. 4 Professor and Head, Unit 2, Department Of Orthopaedics, Christian Medical College and Hospital, Vellore 632004, India +914162282167.